Description: Aprons for Misses, Children and 18" Doll Have a mother daughter cooking day with these charming aprons featuring overall appeal and shabby chic fabrics for misses, child and 18" doll. 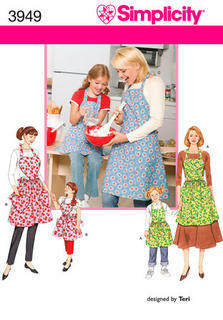 Out Of Print Description: Child's and Misses' Aprons and Aprons for 18" Doll Get cooking in style in these modern fitting aprons with neckband and collar variations. 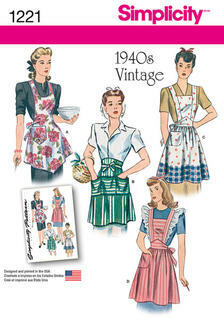 Pattern includes aprons for miss, child and 18" doll. Studio Cherie for Simplicity. These adorable It's So Easy aprons for child and miss feature heart shaped bodice and pockets and ties around the neck and waist. Child, miss & 18" (45.5cm) doll aprons, pincushion in 3 sizes. View A is over the head with tie back and a row of front pockets. View B ties at the neck, back ties gather at waist with two front pockets at the hip. Matching child’s and misses full aprons have bias tape binding, straps and patch pocket trim. A and B have straight hem, C and D have curved hem and pocket flaps. Great for laminated fabrics. 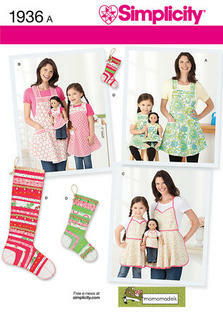 Child's & Misses' aprons, aprons for 18" dolls and stocking ornaments in three sizes sewing pattern. Child's aprons, bags, potholders, and felt accessories. 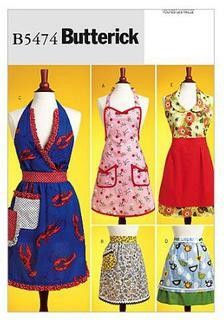 APRONS: Package includes patterns and instructions for five aprons in sizes Small, Medium and Large. Apron A. Apron B: contrast flaps. Apron C: contrast pocket and bands. 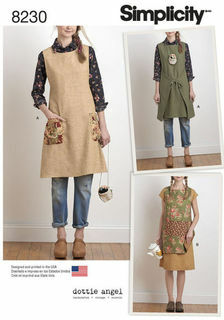 Apron D. Apron E. FABRICS: Cotton, Cotton Blends, Novelty Prints and Gingham. LONG DRESS, APRON, AND RUFFLED HEADPIECE: Dress (fitted through bust) has collar, bodice, waistband, skirt, mock-front button band, and sleeves with seam opening and button cuffs. Purchased optional trim. 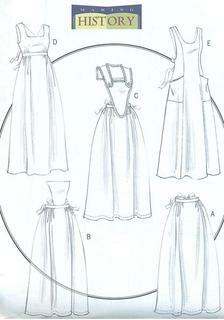 Apron has self-lined bib, shoulder straps, waistband, tie ends, and bib and skirt tucks. Elasticized headpiece has thread loops. B and C: Ruffles, very narrow hem, wrong side shows. Designed for lightweight woven fabrics. FABRICS: Cotton/Cotton Blends. 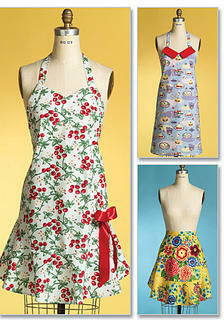 It's So Easy aprons for children and misses are stylish and great for some mother daughter cooking adventures. 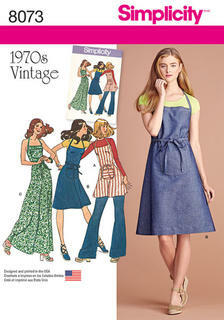 Misses' Dottie Angel Reversible Apron Dress and Tabard Dottie Angel apron dress is perfect to wear while crafting, cooking, baking and gardening. 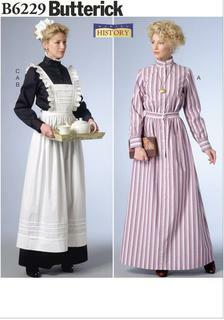 Apron dress has side pockets that can be tied either in the front or back. Tabard is reversible and has kangaroo pocket.